It’s the end of year, and that means it’s time for Domain Name Wire’s annual Domain Dunce awards. Let’s kick things off with a smelly situation. By all accounts the Hotel des Almadies, which housed attendees of ICANN’s meeting at its recent meeting in Dakar, Senegal earlier this year, was far from luxury. Attendees complained of rats, security concerns, air conditioning issues, and non-working showers. That prompted Barbara Ann Clay, ICANN’s Vice President for Communications, to write a nastygram to Senegal’s Minister of Communication asking for compensation for guests. Attached to the letter was a 20 page report from ICANN’s at-large committee (ALAC). But before the hotel or Minister of Communication could respond, ICANN retracted its complaint, writing that the letter was sent without appropriate buy-in from ICANN’s leadership. 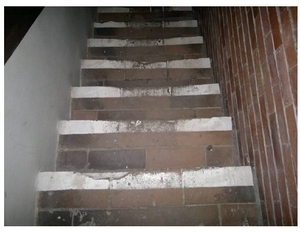 Below: a staircase at the Hotel des Almadies, which ALAC labeled “A dark, steep Staircase” and complained of a “tripping risk”.